We were a bit surprised to find out that Belarus is ahead of Russia in software exports (including development services) per capita: $60 vs $40 in 2014. We were even more surprised that Belarus is actually one of the world leaders by computer services exports per capita close on the heels of India ($66). The country is most likely reaping the fruits of the strong state support for the outsourcing software development industry as the IT cluster with preferential tax conditions was created ten years ago with the lobbying help from Epam, the largest outsourcer in Eastern Europe. Neighboring Russia and Ukraine are following suit by introducing special tax rates for software companies, but the success of these measures is early to judge. Both Russians and Belarusians suffered from currency devaluation last year. First, the Russian ruble got derailed by crashing oil prices and Western sanctions imposed on Moscow for its meddling in Ukraine, weakening almost by 100% by the end of 2014. Russia is the major trade partner for Belarus, and not surprisingly, it dragged the Belarusian ruble down by 50% by the beginning of 2015. Belarusians anticipated this and they even seemed to have become immune to currency exchange shocks as they’ve already been there in 2009 and 2011, with Belarusian ruble losing 300% of its value by 2015. 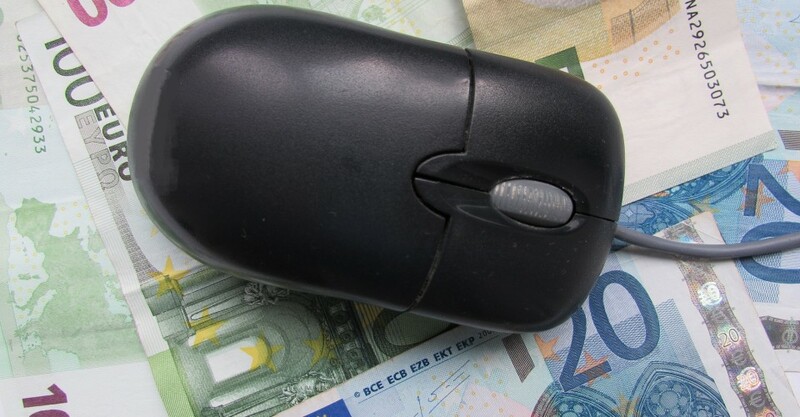 In the meanwhile, Belarusian software companies serving EU clients were hit by the downside effect of salaries tied to the dollar when the Euro went into a nosedive against the greenback in late 2014 – early 2015: those receiving revenue in weakened Euro saw diminished margins while they had to pay out wages nominated in US dollars. Get in touch if you’re looking for a reliable software development company in Belarus, Russia or in other Eastern European countries. We helped big and small companies build teams of 2 to 60 people, with some outsourcing partnerships lasting for over 7 years. If we look at developers’ salaries by programming language, we can see that Python, Java and Android developers earn the most, closely followed by iPhone/Mac OS developers. 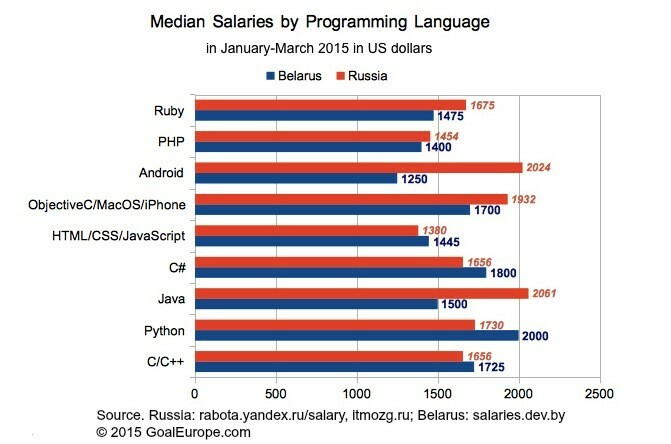 As can be seen from the chart below, some of the IT jobs currently appear to be better compensated in Russia, while some others are better paid in Belarus. 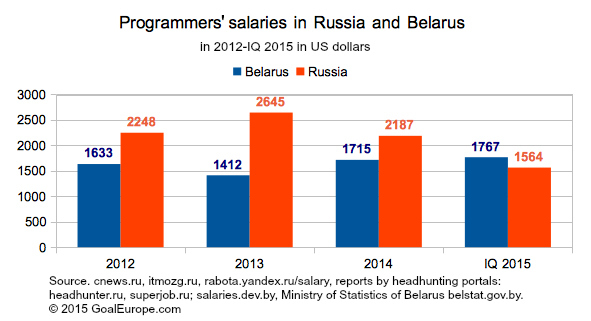 While the exchange rates situation continues to be volatile, the current balance appears fragile, and, according to some HR departments, Belarusian IT developers who flocked to Russia in past years do not appear to be in a rush to return home. In Russia and Belarus, in countries with high income inequality, IT sector has become an increasingly attractive employer as it opens the door to the middle class. In the last few years, universities increased the number of students for computer-related specializations, and many programming training courses sprang up.